Indian technology company Amkette’s Evo TV smart boxes were initially meant to allow users access to more streaming services, and extend the entertainment beyond just the TV channels. Evo TV 2 does a lot more—thanks to the Android foundations. One evolution that immediately stands out is that there is no confusion about how to juggle between apps and games. The Evo TV 2 is all about media playback and apps. Priced at Rs.6,499, it is available on Snapdeal.com. The Evo TV 2 is a very compact box, with a design very similar to an ice-hockey puck. It is 117mm wide, 118mm deep and 28mm thick. There are 4 USB ports (1 on the back and 3 on the side) for connecting external accessories such as storage drives or a wireless keyboard, for example. There is also a SD/MMC card slot, which makes it even easier to view media—such as photos from your phone or your digital camera. Quite a few recently-launched similar Android media boxes (such as iRevo’s Smart TV and a bunch of those with Chinese origins) run Google’s Android operating system meant for smartphones and tablets. This must not be confused with the much more sophisticated Android TV software that Google has developed specifically for smart televisions (such as the Sony Bravia 2016 range) and devices such as the Nexus Player. 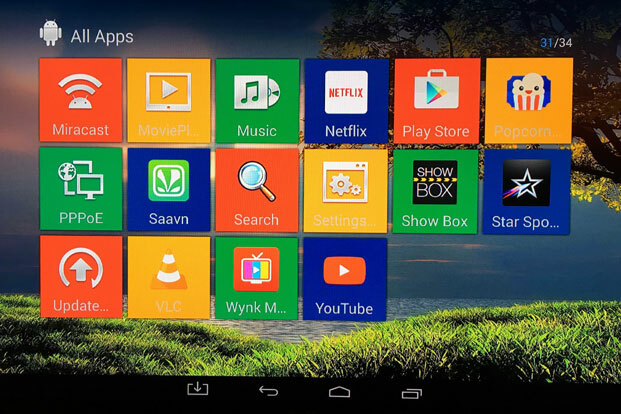 Irrespective, the advantage of Android is the wide variety of apps that become instantly available on the Evo TV 2. To be precise, the software running on the Evo TV 2 is Android 4.4.2 (KitKat). Amkette has wrapped a skin on top of Android, which we feel definitely increases usability as well as makes it easier for users to get to the content they want. 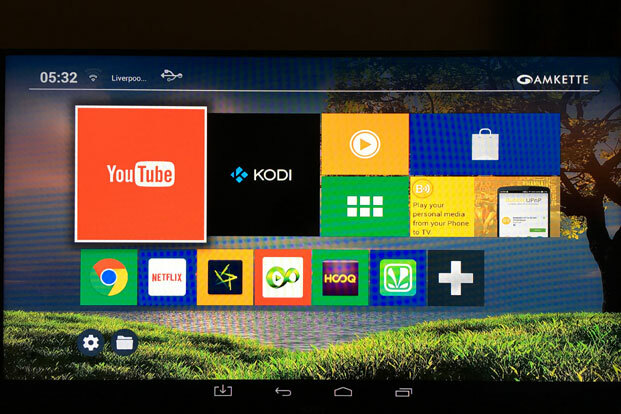 The home screen has a grid based layout—there is one touch access to YouTube, Kodi media server application, a media player app, the app store and the app drawer to access the full list of apps on the device. The grid of six apps below these static elements is fully customizable as well, and you can pin your most used apps—Netflix, Chrome web browser, music player etc. To download apps, there is the full Google Play Store and Amkette has also added its own store that offers download links to some apps that may not be easily available on the Play Store. And since this is Android, you can also install apps if you download an APK installer file through the Chrome browser. 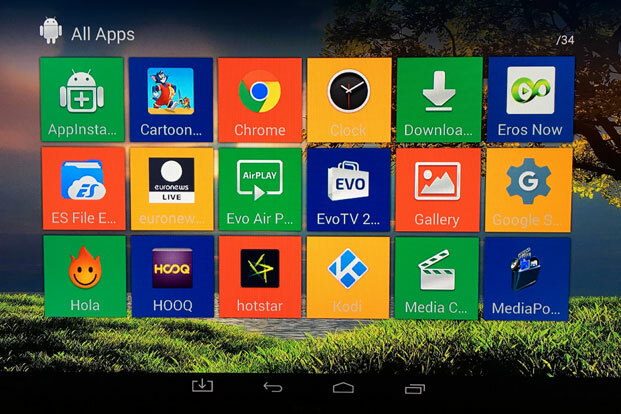 There are a bunch of apps preloaded on the Evo TV 2, such as Hotstar, Star Sports, Hooq, Eros Now, which can be uninstalled as well. The Evo TV 2 runs the ARM Cortex A5 1.6GHz quad core processor, paired with 1GB RAM and the Mali 450 graphics. There is 8GB internal storage, for installing apps, as well as temporarily buffering streaming content. It can play back 1080p full HD movies flawlessly, without any stutters or sluggishness—drag the timeline to fast forward or rewind, and the playback resumes smoothly and instantly. Some aspect of the video playback will also depend on the speed of the external drive you hook up to the Evo TV 2, but the device itself isn’t falling short in terms of power. Playback of TV shows and movies on apps such as Netflix, Hooq and Hotstar is smooth as well. We were able to run as many as 5 apps in the background, before some sort of sluggishness started to show up—hardly any users will stretch the Evo TV 2’s hardware to its limit though. The device can also output up to 7.1 channel audio, which would be good news for anyone who has invested in an expensive home theater setup. The Evo TV 2 has built-in Wi-Fi and Bluetooth, and that makes it easier to share content from your smartphone or tablet. For example, if you install the BubbleUPNP app (free; Google Play Store) on your Android phone, you can simply share media to the TV instantly. The AirPlay feature would be useful if you have an iOS device, though during testing, we found the connection to be a bit of a hit and miss—future software updates to solve this issue. The wireless remote that Amkette bundles with the Evo TV 2 has dual functionality. It works as the standard remote, with direction keys, to navigate the on-screen menu. Alternatively, you can wave it around in the air to use the motion based control feature. We find this quite useful with some apps, but may not always be very convenient. There really aren’t many Android-based media players that are as well-polished and affordable as the Amkette Evo TV 2. It can be the perfect media device for you to stream online content.